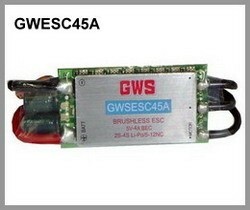 Brushless 5A Micro ESC, Speed Control for Micro Outrunner Brushless Motors. 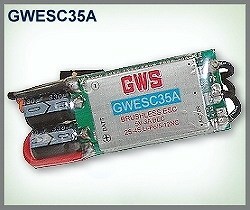 GWS's new brushless control is programmable. Out of the package they are set to auto detect Lithium cell count and with brake feature on. 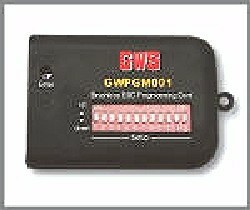 With the addition of the inexpensive GWPGM001 programmer, you can set NiCad/NiMH/Lipo detection modes, no brake-light brake-medium brake-strong brake, Throttle delay, switching frequency and level of timing advance (Auto/5/12/18/25 degrees). A lot of nice features for a low cost control. 1. Battery Cutoff Voltage: Ni-MH 6~16 Cells/Li-PO 2~4 Cells. 2. Brake Setting: No Brake/Soft Brake/Moderate Brake/Hard Brake. 3. Responding Delay Time to Throttle: 0.15/0.3/0.7/1.0 Sec. 4. Switching Frequency: 8 KHz/16 KHz/32 KHz/none. 5. Timing Advance: auto/5 degree/12 degree/18 degree/25 degree.